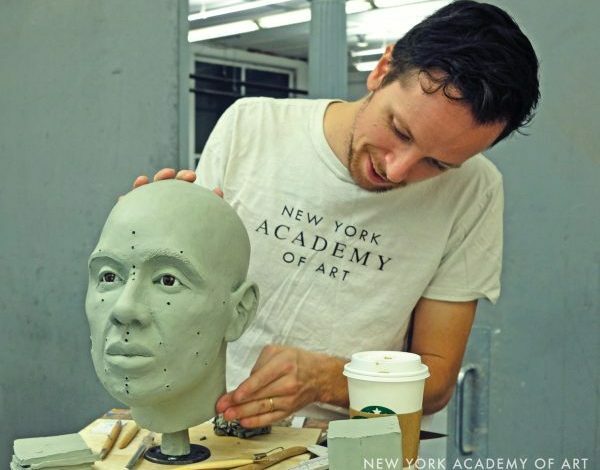 The New York Academy of Art’s Forensic Sculpture Workshop, created in 2015, is the result of a unique partnership between the Academy and the New York City Office of the Medical Examiner, in which art students used skulls from actual “cold cases” to recreate the faces of the victims, in the hope of identifying unknown persons. For the week-long sculpture course, Academy students each receive a replica of the skull from a real unidentified body, and use their sculptural and artistic training to accurately reconstruct the face of the victim in clay, under the instruction of Joe Mullins, a forensic imaging specialist. Bradley J. Adams, the director of forensic anthropology for the Office of the New York City Medical Examiner, called clay facial reconstructions the “last-ditch effort” to identify unknown homicide victims, after methods such as fingerprinting, dental records and DNA testing fail to yield results. Nationally, thousands of skeletal remains await identification. The pilot program at the Academy in 2015 marked the first time the Office of the Medical Examiner had ever attempted this project with an art school, and resulted in 11 busts created from New York City skeletal remains and one positive identification. In 2016, the program was expanded from New York to include skulls from a variety of cold cases all over the country, from Delaware to California, and included two 19th-century skulls from unknown soldiers killed during the Civil War. Starting in 2018, the Academy partnered with technology company Cappasity to create 360-degree digitizations of the reconstructions. The high-definition digitizations, able to be rotated and zoomed, will greatly improve chances for possible identification and Cappasity has given use of its proprietary software pro bono to be used for this project.